Meeta Joshi has multi-disciplinary qualifications and a track record of more than a decade of experiences in multinational corporate sectors in IT & Telecoms project management & Television. Abroad she worked as a Producer, Director, Editor and Script writer for Higher Educational Television Production in India. After earning Bachelor’s in Physics and she finished her post graduation in Electronics (Digital Systems) in Edinburgh Napier University, Scotland. As an IT & Telecoms Project Leader at Ericsson, UK she managed multimillion pounds projects for blue chip clients such as Vodafone UK Ltd and T-Mobile. Her first passion was Media. 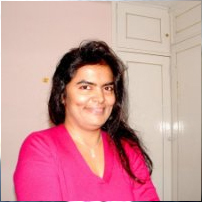 Her experience includes working at Educational Multi Media Research Centre where she produced, directed, edited and also assisted on exceptional Higher Educational TV programmes ranging from Aviation, Space Communications, Art, Architecture, Sculpture, Medicine, Fine Arts to Adventure sports and Ecology. Her programmes are still telecast by countrywide classroom for University grants commission abroad. She does honorary and voluntary service for various community and Educational organisations and as an Interfaith Speaker. She also offers honorary consultancy to institutes globally. With change in life, and health, she pursued her passion for Yoga, meditation and Reiki. Meeta specifies in blending spiritual wisdom in coaching others. As a volunteer she enriched the cultural, interfaith, and arts within the local community and the education sector by holding workshops for nearly a decade. Her passion for equality of rights and urge to empower others led to her receiving Ambassador of Peace Award from Women’s Forum for World Peace. She offers her interfaith honorary service at a local international college and university in the well-being centre and chaplaincy. She is an Executive Coach, an accredited Strengthscope consultant and also offers Project consultancy.